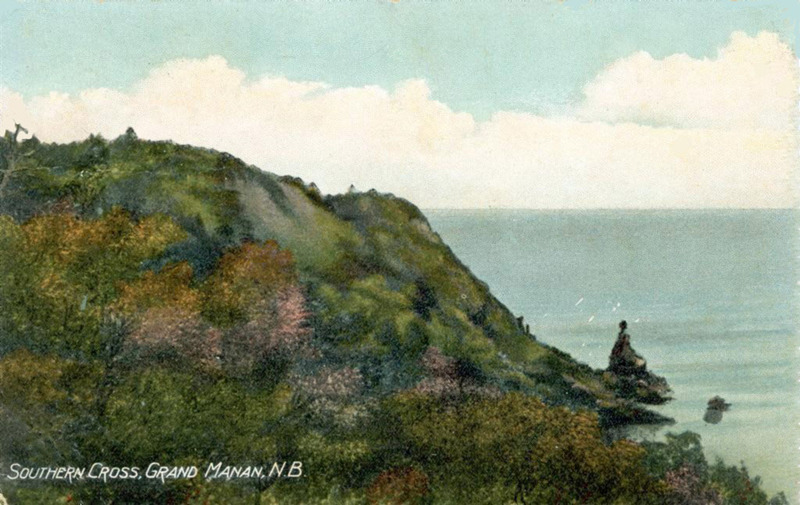 This section started from a few old postcards that I have been collecting, but now it includes some paintings, and many old articles and stories from my collection about Grand Manan. These are PDF files that I have scanned, some fairly large. Feel free to download them for your own reading, but they are not for sale or commercial use. Please make proper credit for any links or references you make to the scans of articles and postcards, which are either my property or of people cited. Greg McHone, in North Head on the island of Grand Manan. North America's Most Endangered Lighthouse, May 1999 Lighthouse Digest Magazine. A report by Shirley Cook about the state of the Fish Fluke Point light. Grand Manan yields diversion and dulse, 20 April 1985. Windsor Star. Nice travel article, except their photo is of Peggy's Cove Light, not one of ours. Grand Manan: A Walk with Bed and Board, 1977, in the August issue of Back Packer Magazine; father and boys do a hiking tour of the island. Nice color photos. 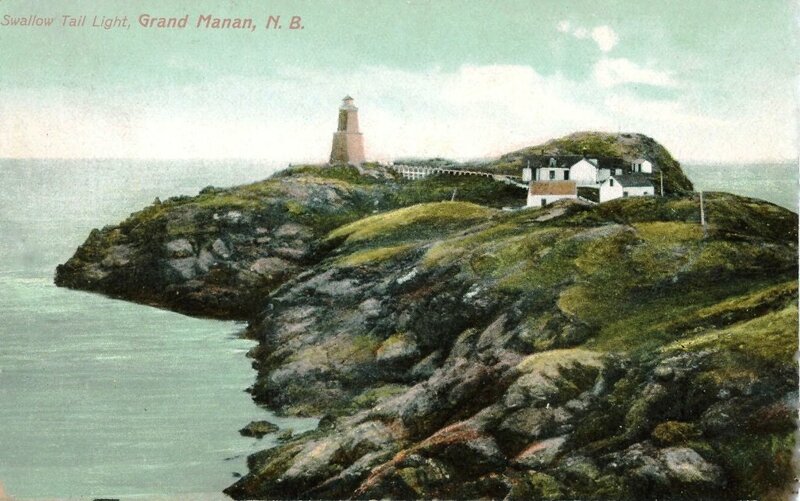 Grand Manan tourism brochure, c.1970, a folded brochure by the GM Board of Trade; note the unpaved roads and many grocery stores. 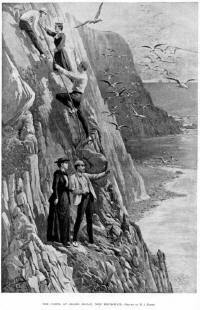 Up the Cliff, 1968; the Reader's Digest story about the dramatic rescue of fishermen at Southwest Head. Grand Manan's Fascinating Shoreline, 22 August 1964, a page from the Passamaquoddy Reporter. Note the ferry schedule. Contributed by Gordon Churchill. The Grand Manan Mood, July 1959, Down East Magazine, by Herbert J. Seligmann, who thought we needed a new ferry! The Island That's Too Good To Be True, October 1953, a story by Ian Sclanders in Maclean's Magazine. Porpoise Shooting, Scribner's Monthly, 1880, an amazing tale of Passamaquoddy hunters. A pdf from scans by Cornell University. Grand Manan, Boston Daily Advertiser, August 1, 1879, Two travelers went to GM from Eastport, staying at the Marble Ridge Hotel. Grand Manan and 'Quoddy Bay, Harpers Monthly, 1878, the author did not appreciate our fog, but there are fine illustrations by Bricher. St. Andrews Bay Pilot column about tourism on Grand Manan, 1878, a little confusing, but Captain Pettes and other inn keepers get compliments. Testimony of James A. Pettes to the U.S. Fishery Commission, 1877, part of an inquiry into violations of the 1871 fishing treaty. Daily Telegraph news article, 1872, the reporter visits a copper occurrence in Eel Brook. Information about Captain James Allen Pettes, collected by. J. G. McHone as of 4 March 2010. Some History and Geology of Pettes Cove, a short blurb with photos by J. G. McHone, March 2010. 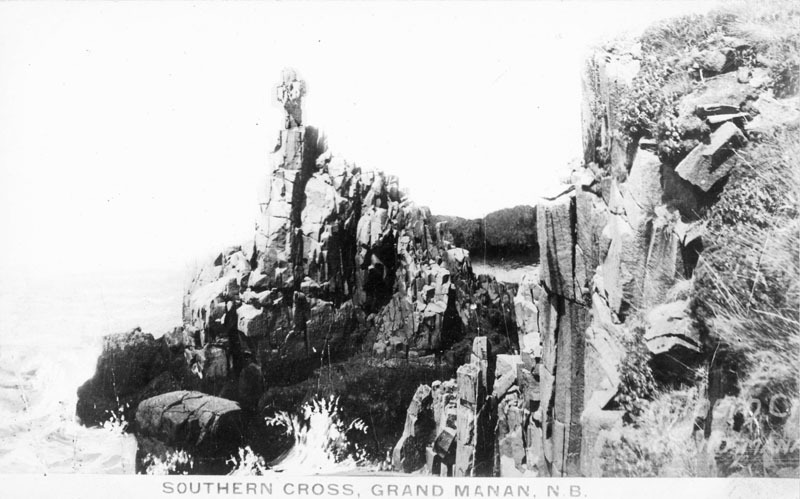 My old post cards and antique prints of Grand Manan are often ones that show geological features of the island. I have scanned my cards, but the images of paintings are from various internet websites. 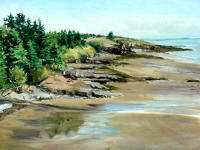 The painting by Nelt Greenlaw is my property, and that and my card images are copyright protected, 2012. 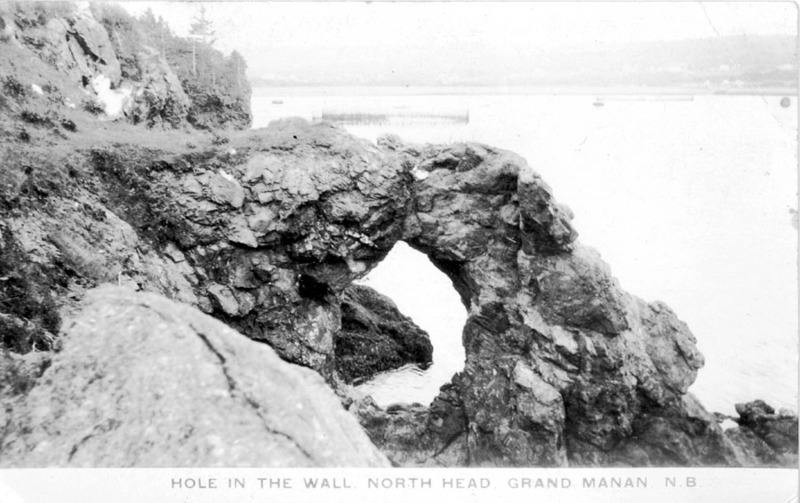 Some images are from collections of the Grand Manan and New Brunswick provincial archives. The images are all reduced to thumbnails, so to see the larger version, just click on it. The card has a date of 1939, and is titled "Indian Beach Head." I take it that the entire section from the overlook bench near The Whistle to the head in the distance can be called Indian Beach, which is along the northwestern shore facing Campobello and Lubec. The head has a big bald area that is now covered by trees. Passamaquoddy people would camp there under the cliffs while hunting porpoise and fish (see the story linked above). The area with their camps is along a sea wall near the head in the far distance. Looking NE on the sea wall at Indian Beach back toward the above photo, a small collection of camps is visible. These were used by Passamaquoddy people in the late 1800s and possibly into the early 1900s, in their summers here to catch porpoise and fish.. 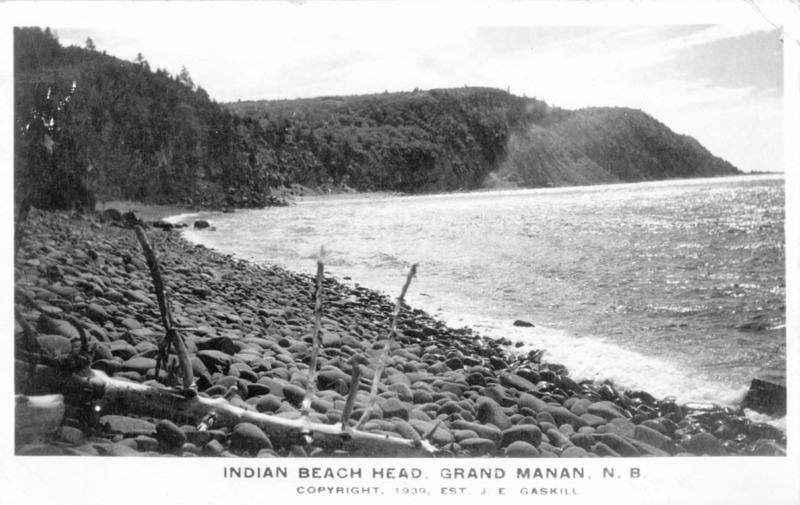 Eventually it became a beach used by Grand Manan dulsers with their own camps, but I don't know when the transition occurred. Note the bare talus slope, part of which has been formed into a stony ramp. This is also an old post card, dated 1908. The view of the Indian Beach camps from above, early in the 20th century perhaps. 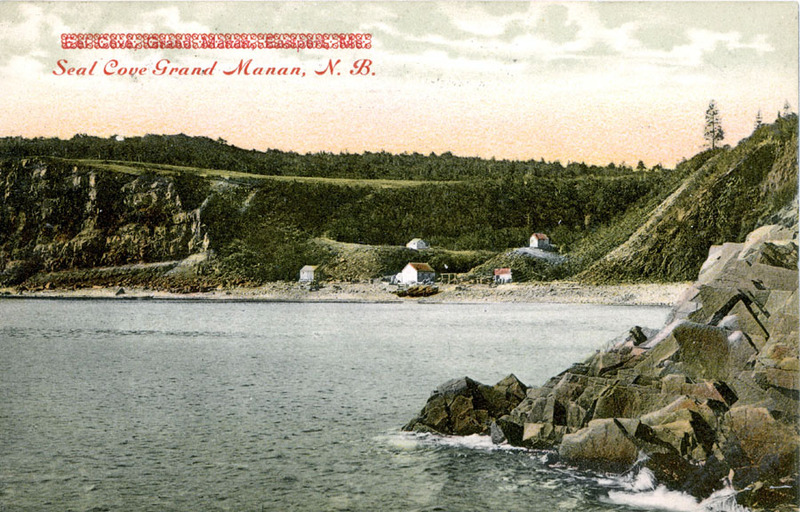 The image is an old photo from the Grand Manan Archives, not a post card. This very old photo (1890s?) 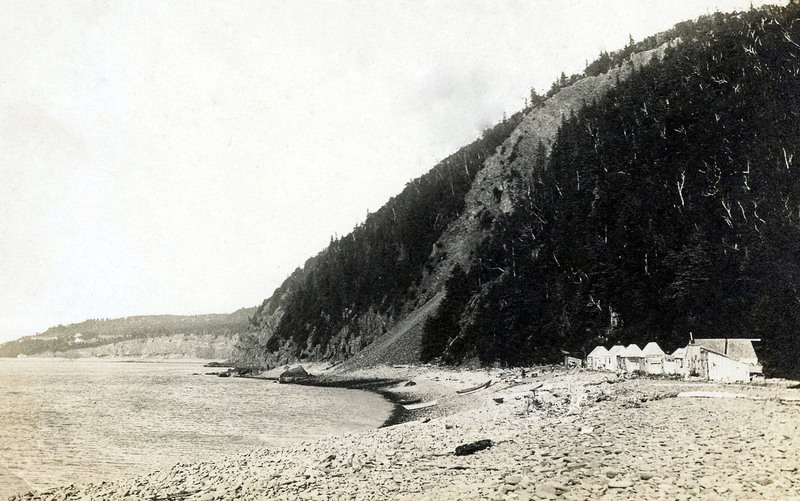 is a close up of some of the camps at Indian Beach, also from the Grand Manan Archives. I don't know if that is a Passamaquoddy or a Grand Manan lady. It appears from the traps that lobstering was another activity. 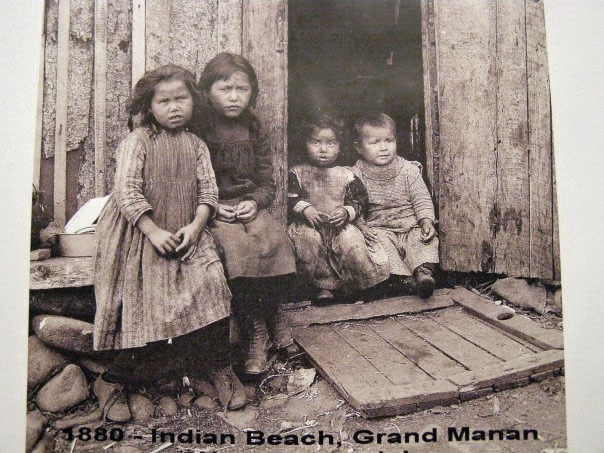 This photo from the New Brunswick provincial archives shows some Passamaquoddy children at their Indian Beach camp. Swallowtail Head (originally "Point") is the subject of countless postcards, paintings, and photos over the past 150 years. This German card was altered by the colorizing artist to make the light tower into a stepped brick tower. Why is not clear! It was mailed in 1907. 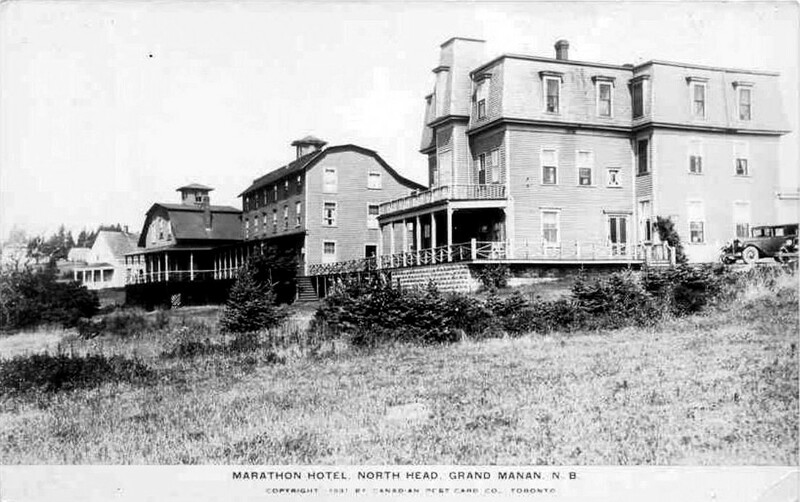 The Marathon Hotel has been open since 1871, possibly the oldest in continual operation in Canada. The gambrel roof building or "the annex" was built in the 1860s as the Marble Ridge House, and moved here in 1898 a few hundred meters from its original location at the top of the field next to Dexters Lane (then called "Marble Ridge Road"). 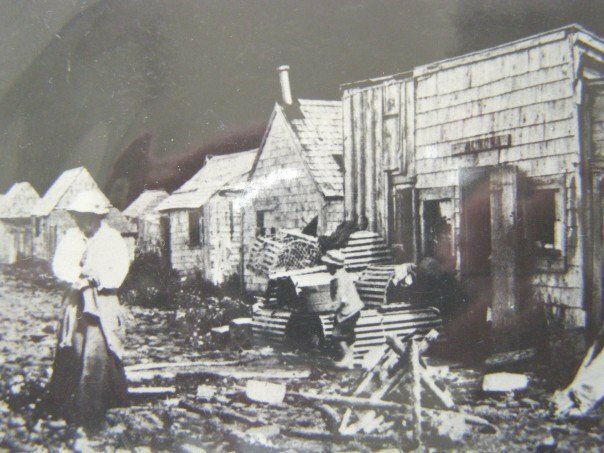 The building farther left was Captain Pettes' house, also moved in 1898 from Pettes Cove. The card is from 1931. 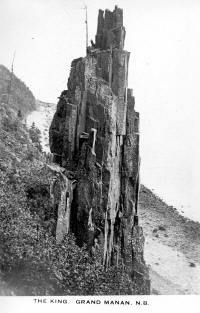 This print is from Harpers Weekly in 1892, titled "The Cliffs at Grand Manan, New Brunswick." 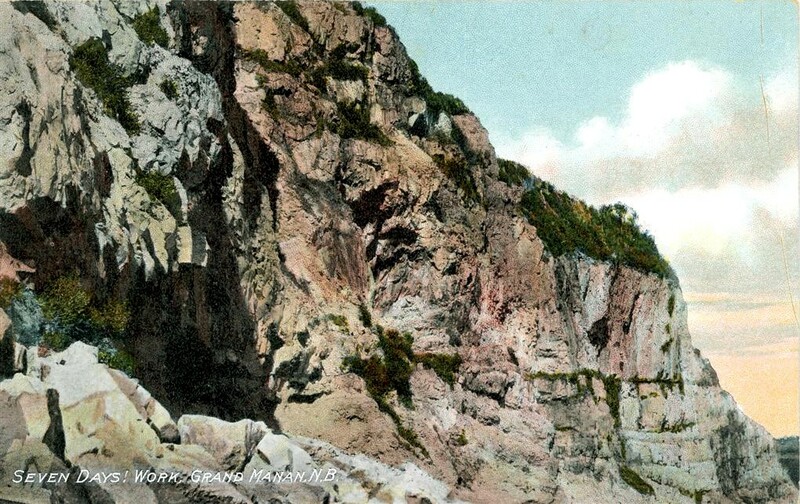 It seems improbable that Victorian gents, and ladies in long skirts, would actually be scaling these steep cliffs. Don't try it yourself, as the basalt is unstable and can break off without warning. 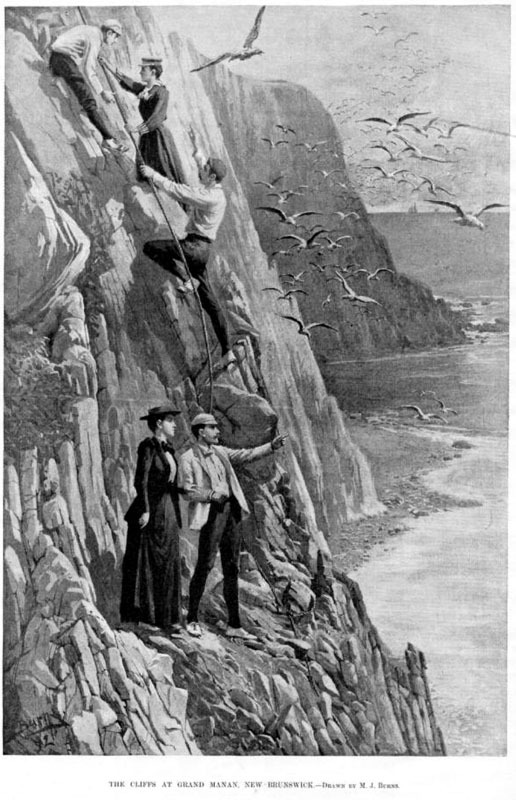 The location is probably Gull Cliffs near Southwest Head, where I am told there was a rope to help people get down and up, as depicted. You won't catch me trying it! Hole-in-the-Wall is eroded out by wave action, assisted by freeze-thaw in the winter. This type of erosion is mechanical and fairly fast, as opposed to chemical and slow (as in limestone caves). The rocks of Fish Head east of Whale Cove are partly meta-basalts, or volcanic lavas that have been recrystallized by pressure and temperature of deep burial (more than 10 km). They are members of the Castalia Group of Late Proterozoic age. A small boat can go through the hole when the tide is right. This 1937 post card does not show much change before how it looks today. At this slow rate of erosion, imagine how long it must have taken for rocks once buried so deep to now be exposed at the surface. 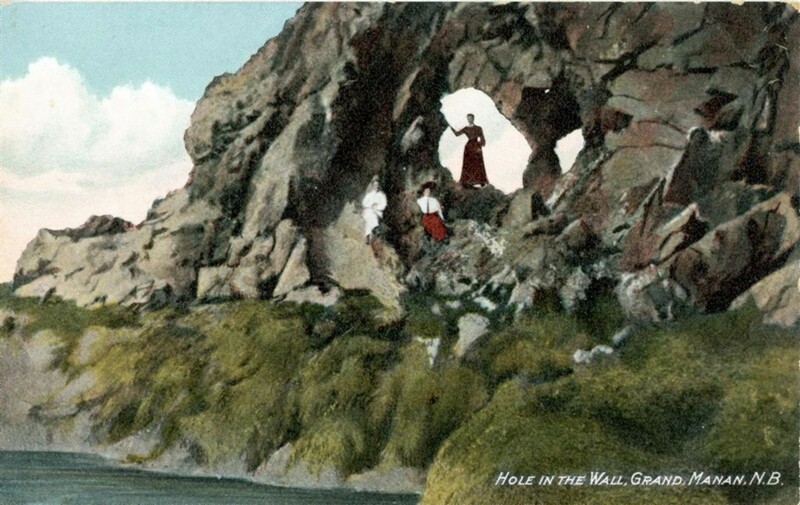 This hand colored card of Hole in the Wall is older than the one above, possibly the 1910s judging from the clothing styles. It looks like there was a columnar structure in the hole, perhaps actually behind it. 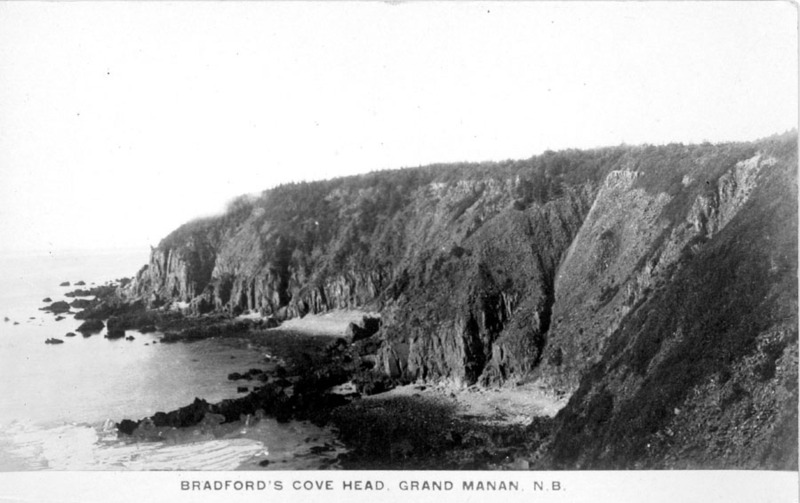 This post card might be from the 1920s and is titled "Bradfords Cove Head, Grand Manan, N.B." I have been to Bradfords Cove a couple of times but I don't really recognize this. Bradfords Cove has an easy scramble down a steep grassy slope to the beach, not a high rock cliff. Also, there is no Seven Days Work member visible here, which is at the cove. But maybe this head is the point to the south of the cove (?). This card is titled "The King" and I suppose this feature looked more regal than "The Bishop." It looks like someone had erected a pole below the top, or maybe it was a small tree. A helpful Facebook friend tells me that it was south of Dark Harbour at a good dulse beach, and it collapsed in a storm long ago (you can see how it was leaning outward). The card is possibly from the 1930s. Note how long the columns are, like spires of a building. The lower member of the Grand Manan Basalt, called the Dark Harbour Member, is a "colonnade" from bottom to top. Southern Cross (also called The Old Maid) was for many years a famous landmark, and an icon used by one of the canneries on their labels. It stood about a km northwest of the light at Southwest Head, and was actually best seen from the water or beach (which is not accessible from the trail above). The stubby cross-arms supposedly fell down in the Groundhog Gale of 1976, and I am not sure what part is actually left to see. Possibly a card from the 1930s. From north of the Southern Cross looking SE, you can almost see the top pf the old SW Head lighthouse. This hand-colored card is possibly from the 1930s. Seven Days Work is the cliff to the west and north of Whale Cove, which has layers formed by repeated lava flows (201 m.y. old, or earliest Jurassic). This card is old enough to be hand colored, but the artist was not particularly careful about accuracy. This hand-colored card is dated 1908, an old one. It has a label that has been corrected to read Seal Cove, but no area near Seal Cove looks like this. It was actually taken from the rock off Ashburton Head looking toward Eel Brook Beach. None of these buildings exists today, as you might know, and all of these cleared areas are now wooded. The buildings may have been camps of the Passamaquoddy Indians, who came each summer up to the 1940s to hunt seals and porpoise. 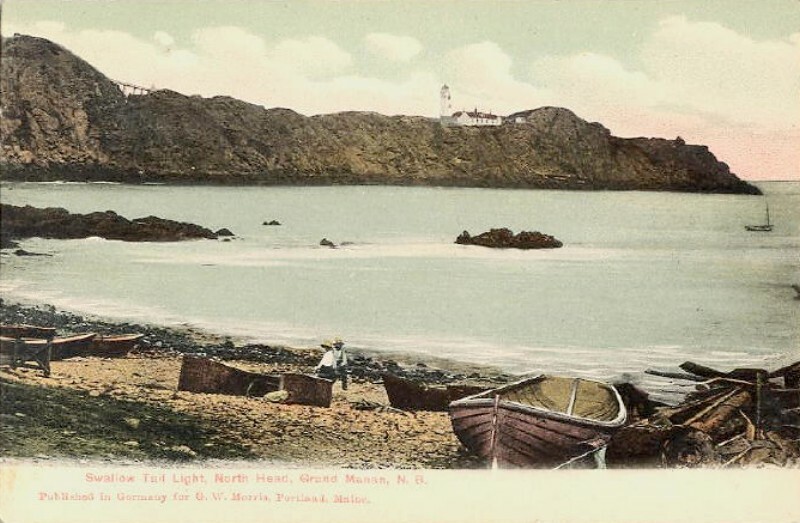 In this card we are looking across Pettes Cove at Swallowtail Head Light, around 1907. 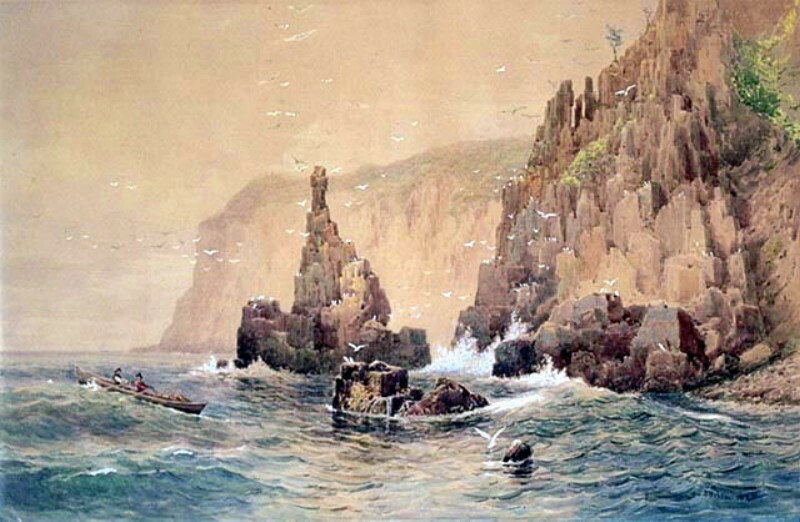 The same viewpoint in the 1870's, in this painting by Robert Swain Gifford (1840-1905) called "Pettes Cove." This cove now has mostly cottages, but it was an active fishing area in the 19th century even though, as we see here, it is rather exposed to storm waves. This 1888 painting by Lucius R. O'Brien (1832-1899) is called "The Grand Cross." 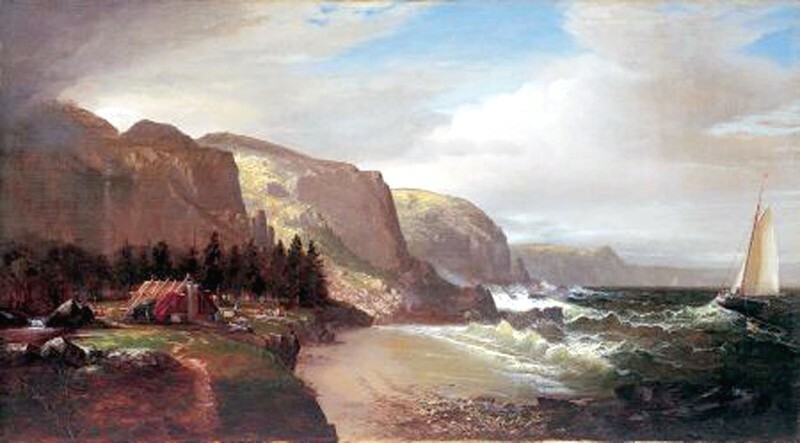 Lucius O'Brien also painted "Eel Cove" in 1880. The viewer is under the cliff of Seven Days Work, looking north across Eel Brook Beach toward Ashburton Head. O'Brien was a well-known Canadian landscape artist, and founding president of the Royal Canadian Academy of Arts (1880). He did several scenic island landscapes, including the Southern Cross. To see more of his work, click here. (some have their labels switched -- see if you can find them). Harrison Bird Brown (1831-1915) was a famous painter from Portland, Maine who did many coastal scenes, including some at Grand Manan. 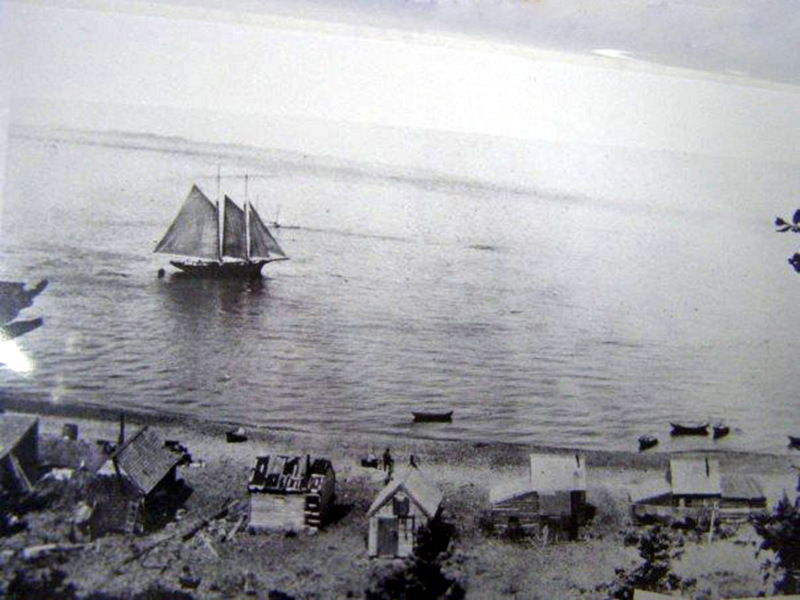 This one is from 1870, called "Camping at Grand Manan with the W. H. Pratt of Boston offshore." 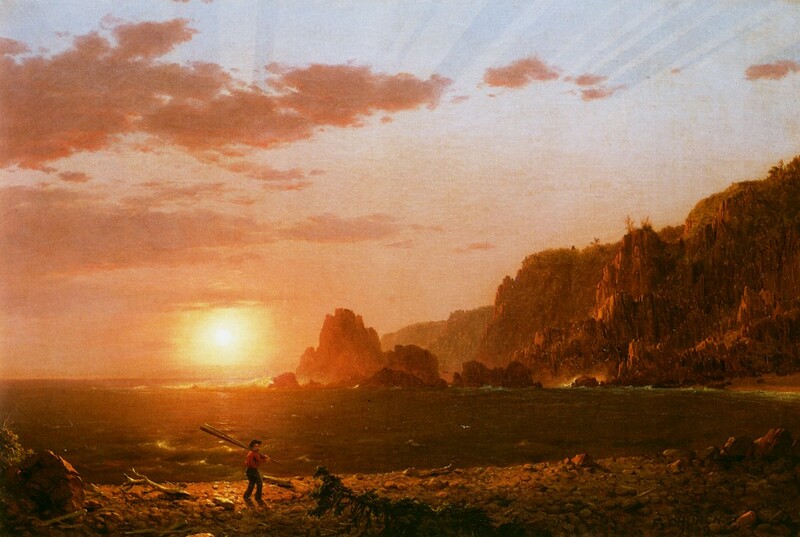 i don't know where this scene is on the island, but it might be about the same as the Bricher Morning painting below. Alfred Thompson Bricher (1837-1908) illustrated the 1878 article posted above, and he did a number of full scale paintings as well. I don't know the date of this one, but it appears to be at Eel Brook Beach looking SE past Seven Days Work, toward Whale Cove. 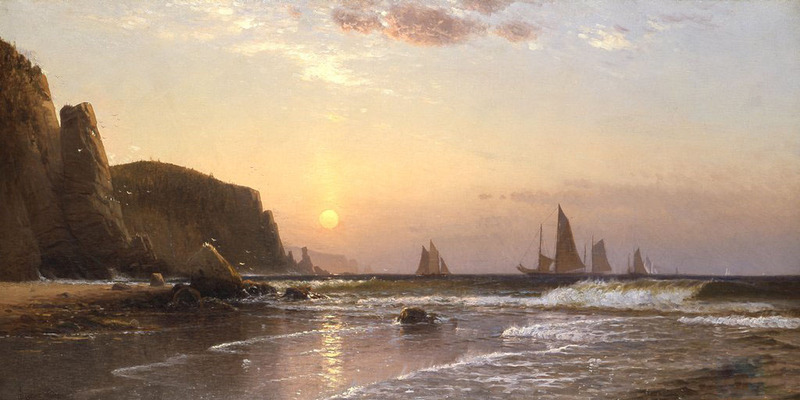 Alfred Thompson Bricher (born in Portsmouth, New Hampshire) was a painter associated with White Mountain art and the Hudson River School. He studied at the Lowell Institute when not working. 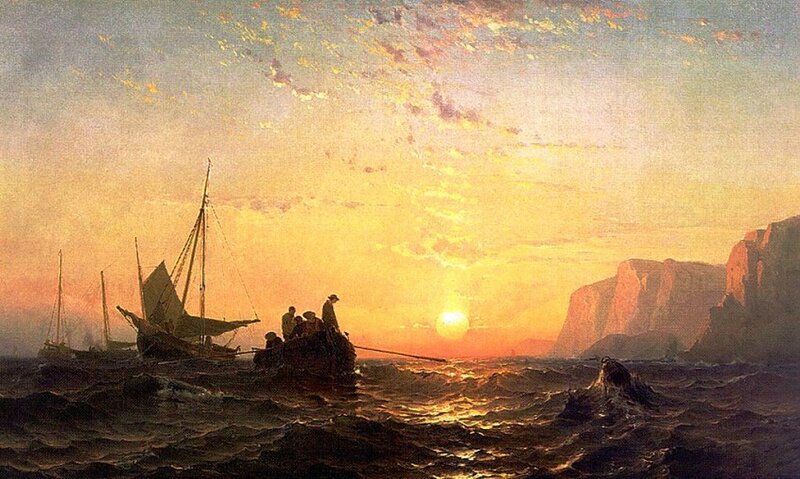 He also studied with Albert Bierstadt, William Morris Hunt, and others In 1868 he moved to New York City and in the 1870s primarily did maritime themed paintings (information from the internet, not my research). 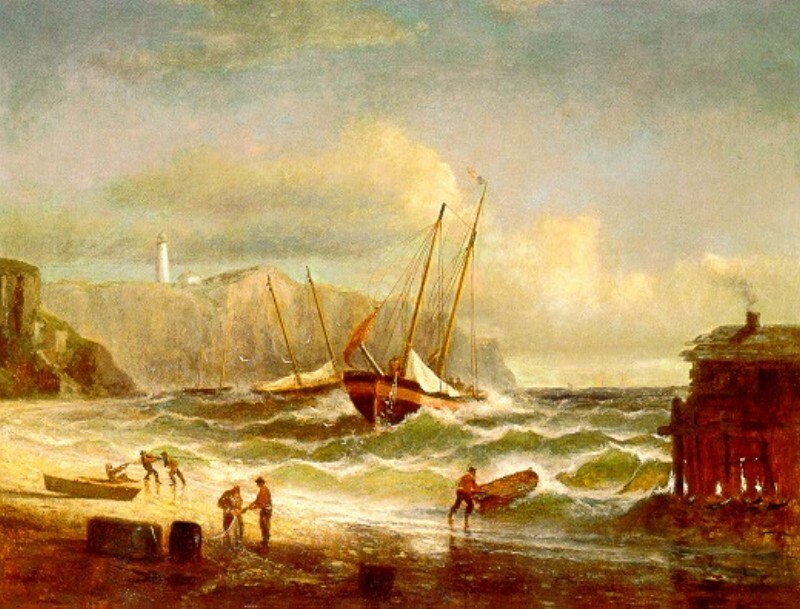 Bricher painted "Morning at Grand Manan" in 1878. It might be along Seven Days Work toward Ashburton Head, a common subject for painters and photographers. 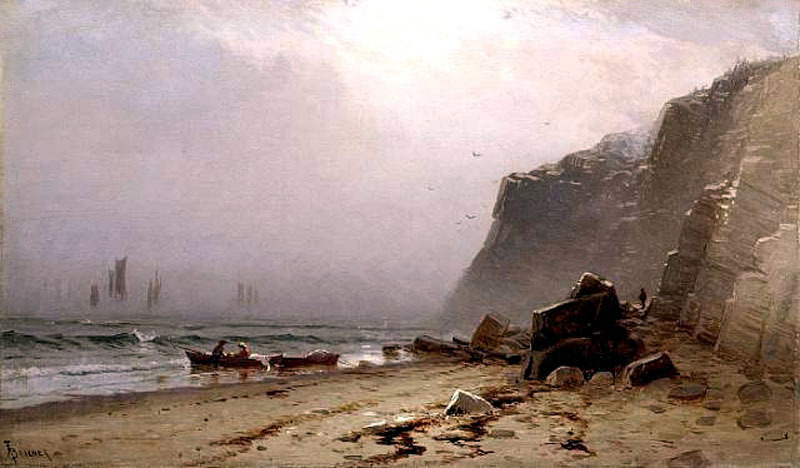 Frederick Edwin Church (1826-1900) was an important landscape artist from Hartford, Connecticut. 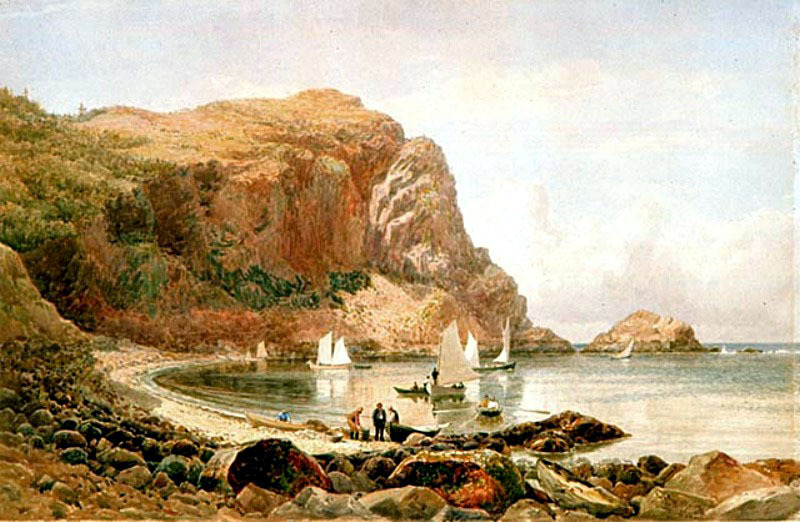 The Wadsworth Atheneum in Hartford has a collection of his paintings, including this one called "Grand Manan Island, in the Bay of Fundy" (1852). It is reproduced by Chinese copy artists and can be had on eBay in any size you want. This image is one of their copies, I think. Church also did this sketch of Ashburton Head, I presume also around 1852. It looks pretty much the same today. Mauritz F. H. de Haas (1832-1895) was a Dutch painter who moved to New York, where he painted numerous seascapes, with several of Grand Manan. He liked to feature the sun on the horizon. 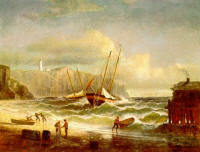 This one is called "Fishermen off Grand Manan." 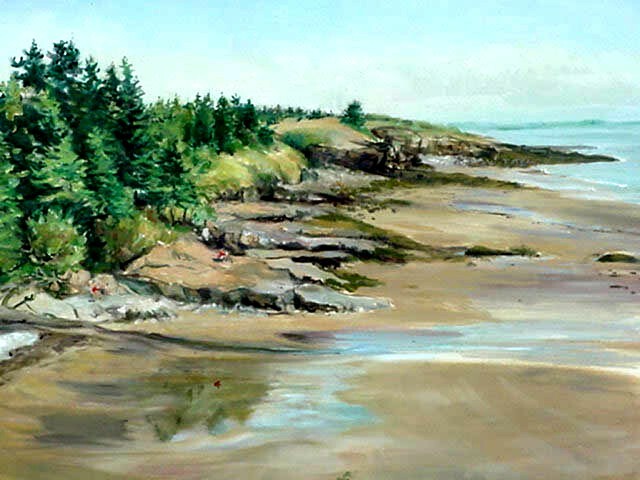 Helen Charters (d. 2007) did this water color of Deep Cove Beach sometime in the 1990's, for Basil and Kay Small of Hole in the Wall Park in North Head. 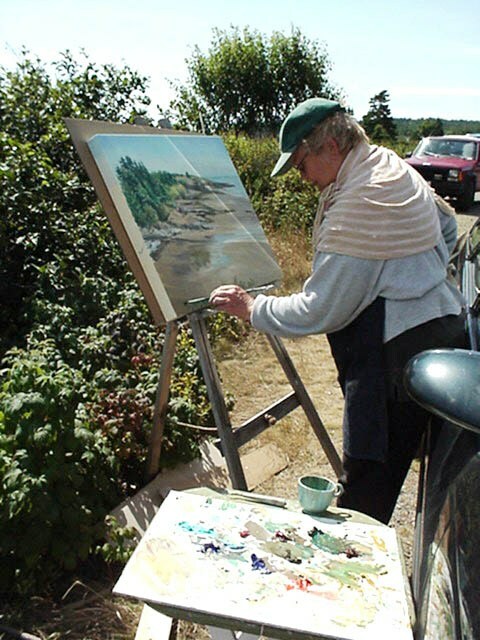 Helen was a fine artist, especially good with water colors, and a great neighbor who is much missed. 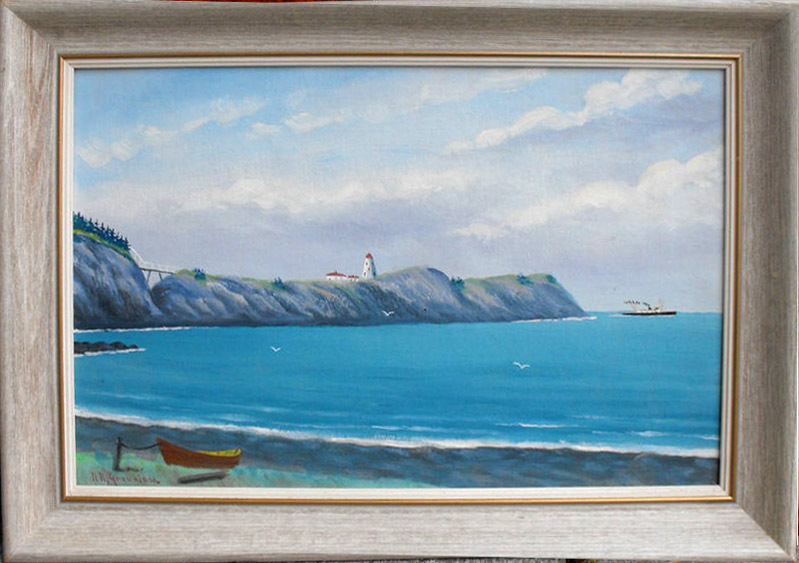 Another local artist, Nelson "Nelt" Greenlaw (1899-1970) painted several versions of some of the same island scenes, including this one of Pettes Cove and Swallowtail Head that we bought on eBay in 2011. Mr. Greenlaw held his brushes between his palms, having lost most of his fingers by freezing. He was a student of artist Wes Griffin, and many of his paintings date from the 1960s.